Happy Holidays everyone. My family’s culture is European so for us Christmas is not just on the 25th but we celebrate the full 12 days with gifts of gratitude. Many of the ex Commonwealth Countries celebrate Boxing Day as the day you traditionally give small gifts to the tradespeople or staff who have worked with you through the year. In Ireland they have St Stephen’s day and across Europe there are the fests of Le Jour des Rois and dia de los Reyes Magos. In the spirit of gratitude and giving I am sharing free tutorials over the next few days. To say thank you for your support through the year and as a sampler of our workshops we have hosted in the past. 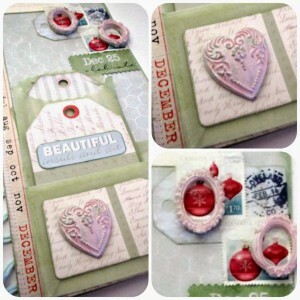 Today we are kicking off with a Melissa Frances supported by Scrapbook Adhesives by 3L. 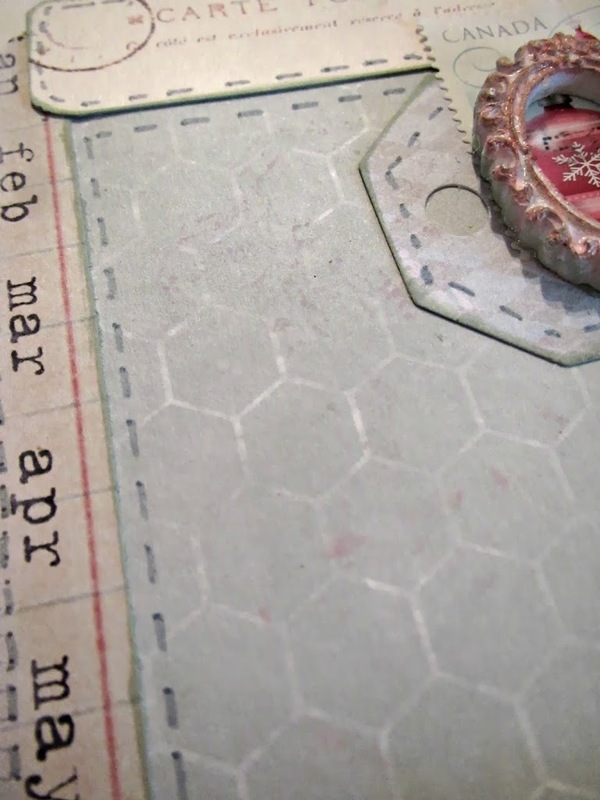 This project has lots of layers of envelopes, tags, stickers, embellishments and trims that are the personalization and make your project uniquely U. A tag is a good base to build a gift card, with little pockets for the gift certificates and personalized with special messages that tell them what they mean to you. This is a classic and pretty project that does not take much time to finish. One of my favourite time savers is to use the right tools or products, like Scrapbook Adhesives tape runners. Their velum tape is very clear or hardly shows at all. 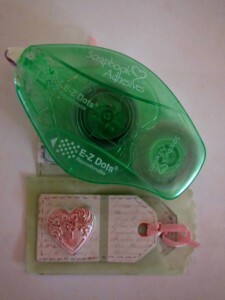 All of the Scrapbook Adhesive tapes hold really well on all kinds of surfaces. Even the fabric pompom trim holds firm with Scrapbook Adhesive tapes. 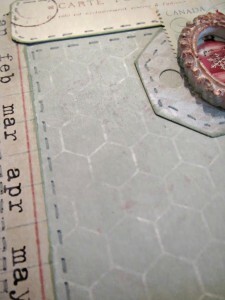 Cover the jumbo tag with Melissa Frances Honeycomb paper. Cut the countdown date strip from Melissa Frances Holiday Notes and attach to the left side of the tag. Add pompom trim behind the tag on the left side. 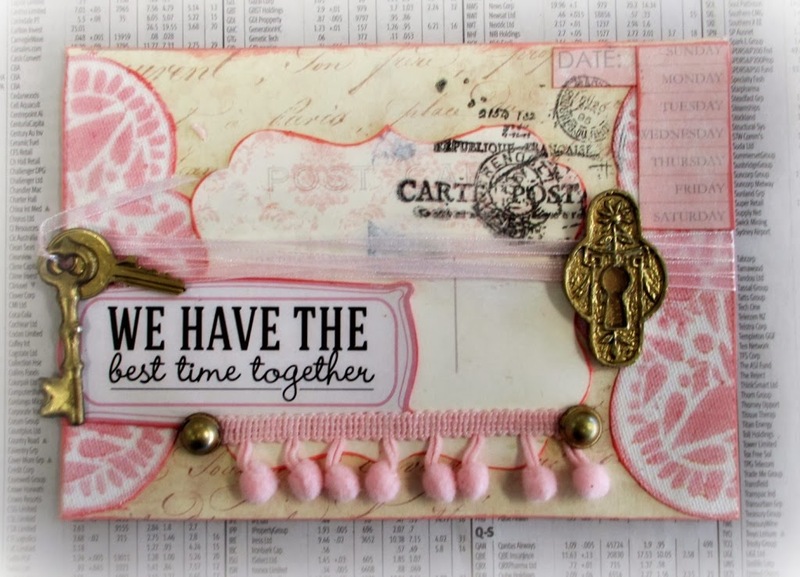 This post card tag is from Melissa Frances’ Christmas Collection but there are lots of postcard images in the Melissa Frances range of papers and tags, if you wanted to try something different. The Melissa Frances velum envelopes come with plain white tags. You can use these as a template to cut colorful tags from matching papers. 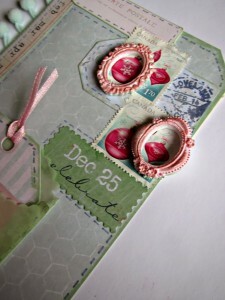 Or use some of the tags from C’est la vie, Hopeful, Vintage Treasures, or the Holiday collection. This is a great place to add special messages that tell the recipient how much they mean to you. 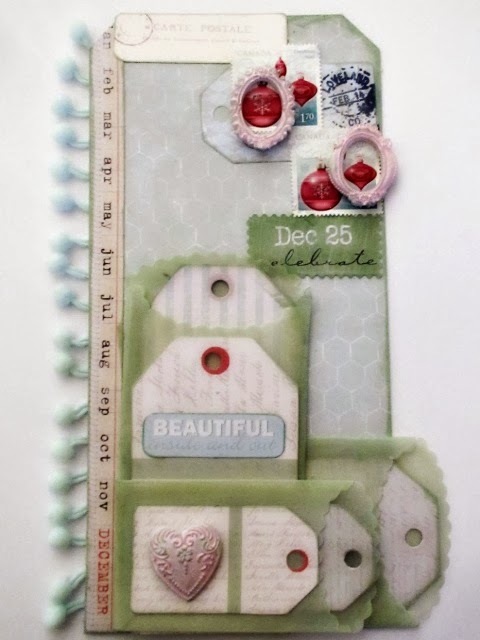 To build up the postage corner, there is a small tag from the Hopeful collection, recycled postage stamps and a Dec 25 tag cut from the Holiday Notes paper. One of the things I love about the Melissa Frances resin trims is that they take colour so well. Because we want this to be a quick project I rubbed them down quickly with a light touch of the petal pink ink and set it aside to dry. Then to give the details emphasis, another quick wipe accented the details nicely when the 2nd coat dried a deeper shade. Start building the envelopes in the left corner, biggest envelopes first, pointing to the right, another on top of that pointing up. The large envelopes are just the right size for gift cards. Finish with a tiny tag and the resin heart. A good trick for bringing a collage together is to hand draw stitching around the edges of all the trims and envelopes with a pen or doodle lines. That tricks your eye into seeing everything as being connected. There you go, a quick and easy gift card holder with personality. Would love to see you soon in one of my full workshops that include introductions to mixed media techniques. This is a little peek from one of the Mail Art workshops. 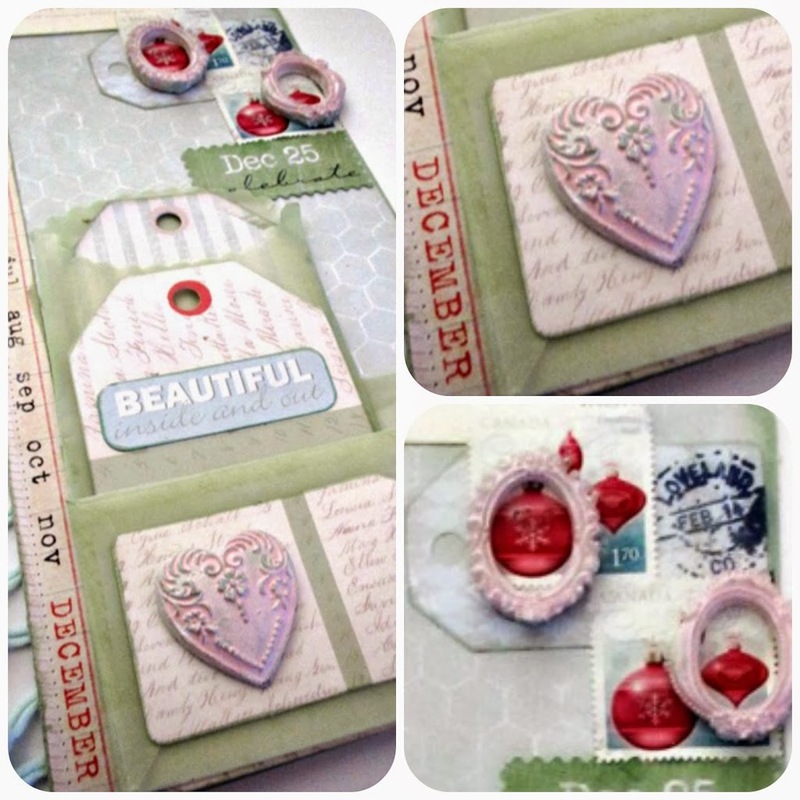 Very beautiful gift card holder and thank you for your tutorial,Mandy!Have a nice New Year´s Eve and a good start into the new year 2014!